Meet Malea, Hanko and Duma, our transport of the week! These three were found in an abandoned house. The Northampton County Animal Control entered the silent house where all was quiet, but the scuffle of puppy feet. After entering the house, the three puppies came into view, extremely emaciated. This was a sign they had not been fed in a very long time, and were left to starve. 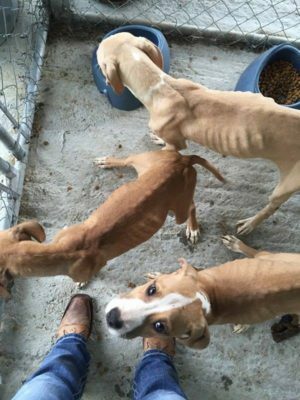 Malea, Hanko and Duma were left in the abandoned house with no food and no water. Warrants were issued for the people that left these three behind to die. After finding the three puppies in terrible condition, the Northampton County Animal Control got a hold of a volunteer at Rainbow Animal Rescue of North Carolina, Jackie Stanley, and asker her if she would be able to take them into her rescue. The dedicated volunteers at Rainbow Animal Rescue worked diligently to get donations to have them vaccinated, spayed/neutered and any other necessities a puppy may need. Especially food. Jackie contacted another volunteer from It Takes a Village Animal Rescue, Cindi Moulson, to see if she would be able to take them in. She willingly said yes. While in the hands of It Takes a Village Animal Rescue, they were working on finding them transport from North Carolina to their new rescue in Middletown, Delaware. Rusty Miller came to the rescue. 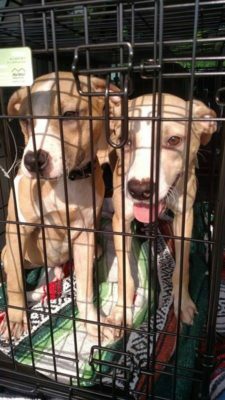 As a volunteer of Liberty Ride Transport, she stepped up to find these pups transportation to safety. Rusty coordinated their transport and setup the drivers after the pups quarantine time was over. Their health certificates were issued, and they started their journey to their new rescue on July 9th. Thanks to all of the rescues and volunteers involved with this transport, Malea, Hanko and Duma arrived safely at their rescue and are ready to find a forever home and to live great lives.